Itchmo: News For Dogs & Cats » Blog Archive » Does Your Dog Need Therapy? « Get Off My Property! Does Your Dog Need Therapy? 1. Does your dog know the spelling, Latin root and French translation of the word “walk,” yet is unable to grasp the meaning of the word “come”? 2. 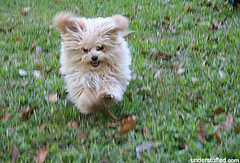 Does your dog immediately leap on a cat, bunny rabbit, or child upon hearing the words “Don’t worry he LOVES cats, bunny rabbits and children”? 5. Does he develop a tragic and profound deafness at the sound of “It’s time to go home,” yet possess bionic hearing at the sound of a can opener? If you answered “yes” to most of these questions, then relax, your dog is normal. This entry was posted on Sunday, May 27th, 2007 at 3:55 am	and is filed under Dogs, National Dog, Cat & Pet Info, Entertainment About Pets. You can follow any responses to this entry through the RSS 2.0 feed. Both comments and pings are currently closed. 6. Is your dog unable to learn to learn to retrieve on command, yet moves heaven and hell and the couch to retrieve the treat that fell behind it? LOL!! My dog is normal!! Thank goodness!! I just thought she was stubborn like my cat! !